We're really excited about Take #1 of Zubaan Talkies, our brand-new series which kicks off this Thursday, 9th February at The Attic, Connaught Place, New Delhi. 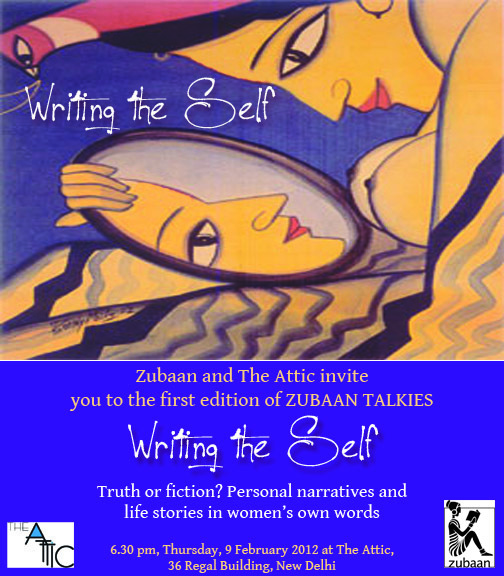 Writing the Self is what we're calling it, and we're hoping to engage you, our audience, in a stimulating discussion about the whole process of documenting the self, by way of autobiography or memoir, especially in a world when gender continues to be so intrinsic to one's identity. We're featuring women's writing, and our host, Anita Roy, will walk you through some of the fascinating issues that emerge the instant one decides to take up the pen and write down the truth about yourself. Actor extraordinaire, Dan Husain of the Dastangoi fame, will read from Anjum Habib's Prisoner no 100, while Nisha Susan will read from Revathi's excellent autobiography about her life as a hijra, The Truth About Me. We're elated to have with us Baby Halder who will read from the Bengali original of her book A Life Less Ordinary, translated into English and published by Zubaan. Trisha Gupta will read from the English translation for the benefit of non-Bengali speakers. Next up, we have Nitoo Das who will perform a few of her poems, possibly from her excellent collection, Boki. And lastly, we have Pratyaksha who will read two posts from her very popular Hindi blog. If you've read this far, please consider yourself invited. We'd love to have you. Try to make it by 6.15pm, in time for freshly brewed coffee/tea and some precious homemade biscuits. And feel free to spread the word and pass on the invite to your friends.